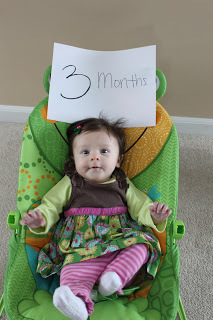 Yesterday was Abigail’s 3 “monthiversary”! I can’t believe how much she is changing. I love all of it. Last night she slept from 8 PM to 5 AM. Then after she ate at 5 she went back to sleep till 8 AM. Wow! She has mastered rolling from her back to her stomach and wants to sit-up like crazy. So yesterday I put her in a play thing that she can sit up in to play with toys and she LOVES it. She is so happy in there. Now she can sit and watch me cook in the kitchen while she tries to talk to me….I love being her mom! 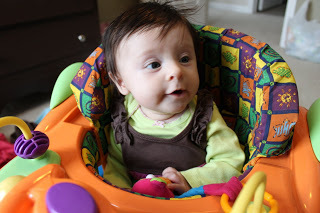 This is Abigail sitting up in her seat having a good time…she can keep herself balanced too so she doesn’t fall forward (she’s way too small for it)! Here’s my angel at 3 months! Her cute dress is from her Uncle Joey! Today in Church our Pastor, Rick, talked about legalism. It was helpful and eye-opening. The passage was based in Luke 6 that deals with the Pharisees and Jesus addressing their man-made rules. Pastor Rick related this with parenting your children and I can’t resist sharing it. I definitely want to be careful that I don’t parent Abigail with legalism because that’s not what Jesus is about. Things to make your kids hate God…. I pray that Abigail sees Jesus for who He truly is and not in this legalistic way. I pray that I would parent in a way that reflects the true character of Christ. It’s easy to get competitive as a parent and want your child to be “perfect” in public. I don’t want to fall into the trap of making my child obey just for my pride and that I would have her true interests at heart. Thank you, Lord. Have Your way!